I ran across something new to me in the Best Tea House near Vancouver B.C. 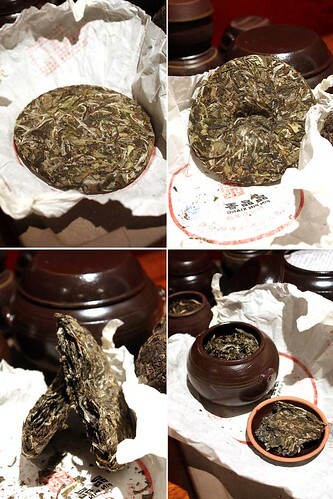 : an aged loose-leaf bai mu dan. The seller indicated that it was 12 years old, factory-stored and only recently packaged. The asking price was $88 CDN 300 grams, which is cheap for any aged tea, but expensive for a bai mu dan. I'd have expected the fruity sweetness of a bai mu dan to have faded to almost nothing after a decade of sitting, but the resulting brew is still richly sweet. The brew is obviously darker than a typical bai mu dan, and it has a strong, complex, woody base flavor that seems to have been added by the aging. It survives a good dozen steepings at full flavor. Anybody else have any experience with this kind of tea? It's news to me. Thanks for posting about it. the best tea house selling something like this? Nope, it's loose-leaf, sold in a box of 30 individual 10-gram sealed pouches. I like the beeng in your picture though. I'd be curious to see the unwrapped cake. There's a shop not far from Best Tea House called Spring Cottage Teas which sells it's own silver needle white and a beeng made from it as well. The silver needle is the best I've ever tasted and comes from the wife's parent's farm. They only get about 10 pounds a year and we always buy a full pound. We just bought one of the cakes this weekend but haven't tried it yet. It must have been stored vacuum sealed if it still has flavor. I don't know... if someone tried to sell me "aged" white tea, my immediate reaction would probably be that they're trying to scam me. I'm just finishing off my 2008 Bai Mu Dan and it seems to be getting a woodier, darker flavour over the past year...a very subtle change to be sure, but it's definitely not going stale and I'm only keeping it in a foil bag sealed with a twist tie in my kitchen...hardly ideal storage! Honestly I've only experienced staleness in teas made from tiny broken leaf bits...anything of decent quality hasn't been difficult to keep flavorful and aromatic for 2+ years I sometimes take to finish a package of tea (I buy many varieties and faster than I can drink them! ), and I'm sure with better storage techniques...such as perhaps keeping it in an airtight porcelain canister a Bai Mu Dan could age well over 12 years. I've seen lots of threads like this one in my time lurking about before I was able to register. Bottom line is ANY tea can be aged. For example, I've had both stunning and crappy examples of aged greens in my time. Do they retain this mystical "freshness?" Of course not. That being said, if they are properly stored and roasted, they can morph into very interesting examples. Whenever I buy a tea that I'm less than excited about, I tend to store it for a few years, roast, store another bit of time and re-taste. Frankly, some stuff I thought was horrible has transformed into some really tasty stuff this way. If I still don't like it, I repeat the process. Generally, there will be a stage in every teas life where I'll just say "wow!" Of course, there is some stuff that starts out crap and remains so forever. Zanaspus wrote: I've seen lots of threads like this one in my time lurking about before I was able to register. Bottom line is ANY tea can be aged. For example, I've had both stunning and crappy examples of aged greens in my time. Interesting, yes, very interesting indeed. Compelling? ... less so for me anyway. While I do try to redeem a weak or stale green with a roast or refreshing, the biggest point for me with greens and whites is they are minimally processed and as fresh as possible. A good example is usually best enjoyed this way with few exceptions. IMHO. Kind of like "tea, the way nature intended it." Or as close to it as possible anyway. Of course, this is also different than raw pu-erh from green or white tea. Well, the couple I recall have been in the "claimed" 10-15 year range (can one ever really be sure when one is buying aged tea?). The flavors tend toward the fruity, much like an aged or roasted TGY without the flowery overtones. If one approaches it as a tea rather than a green experience it is very rewarding imho. Never had an aged dragon well...not sure I'd be willing or able to do it myself as I love the stuff too much as a baby. Imen currently is offering one on her Tea Habitat which I must say has my interest piqued. I'll be sure to report back here with tasting notes rather than fond memories should I take the plunge. Jing Tea shop posted a tasting of a 15 year old green tea. how do u roast green tea just it in a pan and heat it? even so u mean a different kind of roasting, do u know if its possible to make something like hojicha yourself? 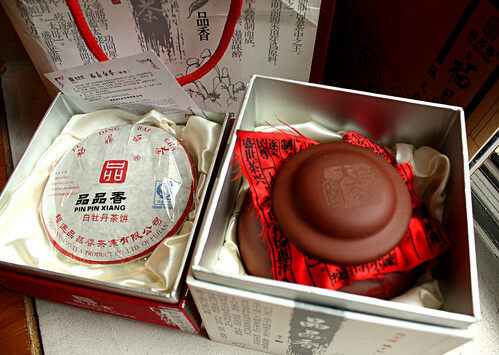 Just a note the tea cake is not an actual White tea (白茶 bai cha) like Bai mu dan, or Yin zun bai hao. It is a kind of large variety white leaf made in a similar process to Sheng Pu er, but as with white tea the leaves are left to ferment just a bit. A true white tea would break down from the heat it takes to form in to a cake, thus you will never see a white tea this way. Domestically here in China it is called "New Process Tea 新工艺" and is marketed as white tea or as white Puer or Moonlight Puer (白月光 Bai yue guang.) Actually the technical and correct name would be New process tea because that is what it is. Traditionally there arent any white, green, or yellow teas that would be trated in this way. If they are authentic valued teas there would be very little remaining by the next years Spring harvest anyway. I am not saying that experimentation into ageing/storage is negative in any way, just that traditionaly it never was done becasue the nutrition of the green/ white tea would fade therefore its value would be lost as well. In the case of teas made for ageing (Black tea, Pu er, certain Wu Longs) the nutrition of a good tea would be increased from secondary fermentaion thus the value would increase accordingly.